Chanakya Thoughts in Hindi are a try to highlight the wisdom of great Indian thinker and philosopher Chanakya. Though, Chanakya was a single person; however, he has experience of many fields. He was a highly motivated person who worked to create the united and glorified India. This was the power of his wisdom that he accomplished many things in the highly hostile environment. Chanakya was an ancient politician, diplomat, economist, scholar and a great thinker from India. It was wisdom of Chanakya only which helped an ordinary boy Chandragupta to become first emperor of Maurya dynasty of India. He was believed to be first leader who dreamed about united India and achieved it through Maurya rule. 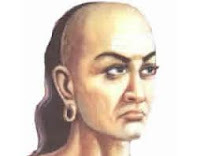 Chanakya was product of world famous ancient Indian university Takshashila where he was economics and political science professor. His great work is present in front of us in the form of Chanakya Niti, a text originally written in Sanskrit. Chanakya Hindi Thoughts is a try to make available his great work in the form of HD Picture Messages in Hindi Languages. English translation of these Hindi thoughts is also available below every message. The good point about his Quotes is that they are very much relevant even today. Any person can live a happy, peaceful and successful life by learning important lessons of life from the Chanakya Niti. Chanakya Niti is not only popular in India, however, many people across the world appreciate it. Chanakya has the ability to think much ahead of his time and therefore, he gave us many valuable lessons of life.